Reebok today announced that it has been named an International CES Innovations 2014 Design and Engineering Awards Honoree for the Reebok CHECKLIGHT™. Products entered in this prestigious program are judged by a preeminent panel of independent industrial designers, independent engineers and members of the trade media to honor outstanding design and engineering in cutting edge consumer electronics products across 29 product categories. Reebok CHECKLIGHT™ is a groundbreaking sports activity impact indicator designed for athletes of all ages and skill-levels. The CHECKLIGHT™ skullcap is for use in all helmeted and non-helmeted contact sports and activities. CHECKLIGHT™ uses multiple motion sensors to provide actionable impact data to help assess an athlete before continuing to play. An easy-to-read display of red and yellow lights indicate the level of impact. The Reebok CHECKLIGHT™ is the first impact indicator that comfortably fits wearable electronics directly on the athlete, not on the athlete's protective equipment. Embedding flexible electronics into a closely fitting skullcap helps to accurately measure direct accelerations in real-time. "At Reebok, we are committed to technological and engineering innovations that will help people be fit for life," said Paul Litchfield, Reebok's Head of Advanced Concepts. "The more we learn about head injuries, the more we understand the long-term ramifications and we want to do our part to help ensure people can participate, compete and enjoy their favorite fitness activities throughout their lives." "There is still much to be learned in this area, but we believe technology can play a significant role in improving the athletic experience. We're proud that a product we designed to help people stay fit for life is also being recognized by CES, who are a trusted authority on tech and innovation," said Litchfield. More than three years of lab and multi-sport field-testing with hundreds of athletes ranging from youth to professional have served in the development and validation of Reebok CHECKLIGHT™, which utilizes the award-winning conformal electronics technology platform developed by Cambridge, MA electronics company MC10 to help ensure the product is comfortable and non-distracting to the athlete. During the creation of CHECKLIGHT™, Reebok has worked with head trauma experts in the medical and academic fields and professional athletes, including NFL quarterback Matt Hasselbeck. The Reebok CHECKLIGHT™ is the first consumer electronics product launched at Reebok as part of an advanced research and development initiative to introduce wearable fitness technologies that will help people reach their fitness goals and stretch the limits of the fitness industry through technology. 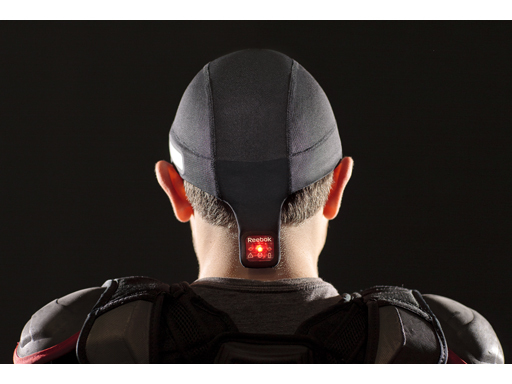 Reebok CHECKLIGHT™ will be displayed in The Venetian at the 2014 International CES, which runs January 7-10, 2014 in Las Vegas, Nevada. Honorees will also be displayed at CES Unveiled: The Official Media Event of the International CES from 4-7 p.m. on Sunday, January 5 in South Seas Ballroom C at Mandalay Bay.